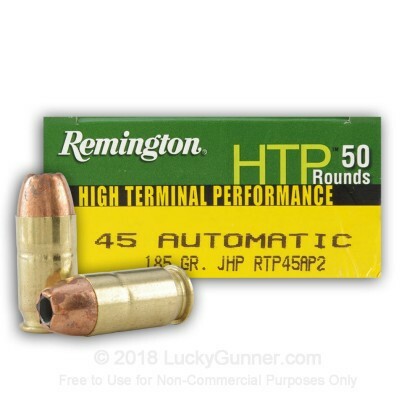 Remington 45 ACP HTP gives you the confidence and instant-stopping power you need for when it matters most! 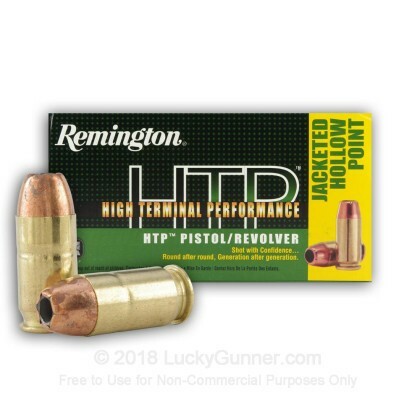 Remington's HTP bullets are designed to deliver excellent controlled expansion and maximum weight retention making them the ideal self defense cartridge. In order to find out how different self-defense handgun loads perform, we decided to do some ballistics gelatin testing of our own. 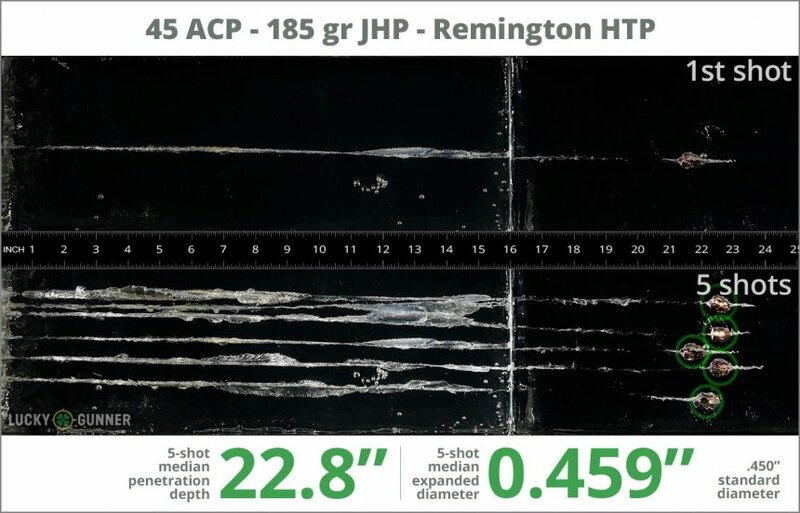 The chart below is a compilation of expansion and penetration data for Remington 185 gr HTP fired from 10 feet, through four layers of fabric (to simulate clothing), using a Kahr CW45 pistol. 1.04" This ammo: 0.46" Min: 0.45" Median: 0.64" Max: 1.04"
22.8" 0" 8.3" 16.7" 32" This ammo: 22.8" Min: 8.3" Median: 16.7" Max: 32"
Very good performance but a little pricy. Shot through three of my 45's, Kimber, Les Baer and Sig and performance in all three were very good!! 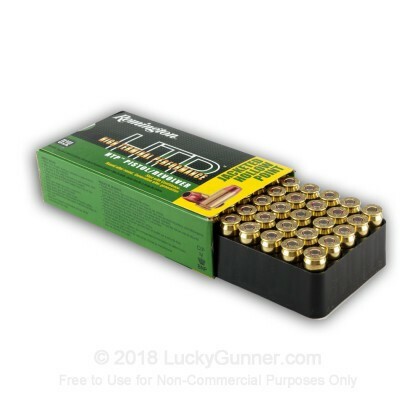 I shop 4 or 5 websites to purchase ammo and you are usually higher priced but delivery is very reliable. bought these to run through my Kimber. Ran 200 rnds thru without failure. Found the performance to be above most other ammo used. bought these to test in my RIA Longslide i also use this round in my carry weapon" Para WartHog " . The HTP groups very well @ 25yds. out of my 6". 1" or less on the bench , chronographed a five round string High 1,068Fps, low 1.027fps extreme spread 41.46 fps , ave vel. 1,047fps. I believe this will make a good hunting round. I also tested the Golden Sabre +p load It will be my first choice for a hunting load. A very excellent round. I actually bought a couple of hundred from Lucky Gunner. And I will buy more. Suffice it to say that I'm alive, and they aren't. Love running these through my Kimber.